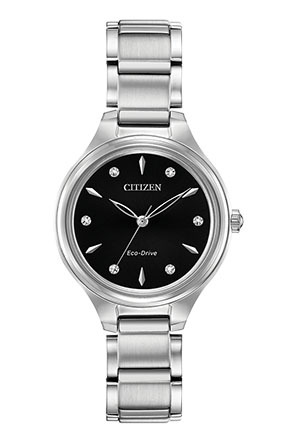 The CITIZEN® Corso collection offers a classic, contemporary style for the simple watch wearer. Functional simplicity with a touch of elegance. Shown here in stainless steel with a contrasting black dial and diamond accents. Featuring our Eco-Drive technology – powered by light, any light. Never needs a battery.